The truth is that we may not be doing our jobs in the safest possible way or even conducting our personal business in a safe manner all of the time. We tend to put ourselves at risk each day and so often do not know it because we have done something at-risk so many times it just becomes the right way of doing things. It is the intent of our book to help you discover way to prevent loss producing events from occurring. The development of a JHA must include elements that go beyond just listing a job’s steps. While not part of the actual JHA, organizational, and human performance elements and issues directly influence the effective implementation of the process. Even with an in-depth understanding of how to develop a JHA, getting the leadership team and employees to buy into the effort involves more than a mechanical, rote filling out of a document. The JHA is still viewed as an additional activity not a fundamental part of an overall safety system. As with the issue found in quality control where the effort was to fix defects and not the cause of defects, loss-producing events still focus on the immediate cause and not the reduction of risk found within the system. Various levels of activities must be considered in order to improve the existing the safety system. After decades of research and insights within the safety profession, the misconception still remains that the majority of injuries are due to unsafe acts or human error. Why? Improving safety efforts are still in many cases restricted to trying to change employee behavior through incentive programs, games, or low value activities such as exhortations (lecturing), posters, and the like. Organizations have a “built-in” resource that can be utilized in the JHA process. This resource is its employees who have the direct experience about the job, its required steps and related tasks. When engaged and motivated, employees can be excellent problem-solvers as they are closest to the “what, when, why, and how” of required actions that must be accomplished. An important objective of a JHA process is to assist the leadership team and employees in understanding and improving their knowledge of hazards and associated risks. A hazard and risk assessment is accomplished by conducting structured surveys that are designed to review the organization’s operations. An analysis is completed of the assessment survey findings to establish the nature and potential impact of activities, potentially unsafe practices, and any history of at-risk or loss-producing events that may have occurred. Untold thousands of interactions are occurring every day in the average organization. The JHA process can aid in these interactions, for example, job requirements, specific activities, the required steps, and tasks of a job, etc. JHA provides the blueprint for designing and customizing surveys and inspections to be used within the safety system. It enhances the ability of an organization to anticipate and understand how job elements (steps and task(s)) combine and interact with each other. Organizations are dynamic and are always in a state of flux and can change due to many types of internal and external influences. These influences are always present and do not always act consistently. The premise is that the JHA when considered the centerpiece for a safety system provides the critical linkage between all aspects of a Safety Management System. The view of the JHA as the linkage is used to provide essential information for the leadership team and employees about the scope and severity of hazards and risk exposure. With this information, the leadership team can then better weigh the impact of changes in job related tasks and select more informed decisions as loss-producing consequences are made visible. The concept of risk must be clearly defined and included as a major element in the JHA process. Using only loss-related data that is solely based on injuries, incident rates, and/or damage does not provide a full understanding of the potential for loss-producing events. This data only provides a snapshot of what has occurred. To understand how risk affects an organization, a risk assessment must be conducted. A risk assessment determines where hazards and associated risk may exist but may or may not have resulted in a loss-producing event. One goal for the job hazard analysis (JHA) process is to become self-sustaining and effective. That goal first begins by establishing a JHA committee that can provide experience, expertise, and assistance in developing the process. A properly structured committee working on the JHA process increases the effectiveness of the safety system. For the JHA to become an integral part of the organization’s planning and daily management activities, a focused committee approach provides leadership and can guide the necessary activities if given the tools and authority to make change. Before starting the JHA development, determine and carefully consider who is going to be on the development committee. Experienced employees actually doing the job should be involved for a comprehensive job steps and tasks development. The insights and perspectives of all employees should be considered as solid insights from unlikely sources may come out of the process. The JHA process involves developing an inventory of jobs and a search for non-routine jobs that may be hidden from view. The use of the JHA committee and employees can improve the depth and scope of the JHA portfolio. The JHA process can restore the feel of the workplace as it identifies how things are getting done and how hazards and associated risk are controlled. 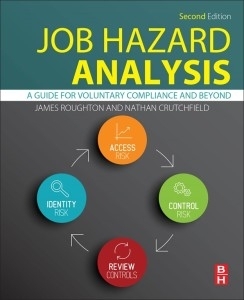 The job hazard analysis (JHA) process begins by selecting designated jobs, ranked in order by priority, and ends with standard operating procedures (SOP.) Used this way, the JHA process provides a baseline for the development and refinement of SOPs, safety protocols, work instructions, and guidelines. Consider the job as a whole system when breaking it down into individual components of action steps and the tasks required within each step. The suggested method to structure the JHA is through the use of the Ishikawa or “Fishbone” diagram. This creates a cause and effect graphic diagram of the job, its steps and tasks along with the tools, equipment, materials, environment, administrative documents, and employees exposed to the job. A successful job hazard analysis (JHA) will involve collecting job data, developing the job steps and tasks, creating cause and effect diagram(s), the hazard assessment, and using a risk matrix to identify probability, and severity. The JHA should be cross referenced against documents in human resources, quality control, process management, security, maintenance, and other departments that may have safety related criteria to prevent confusion or conflicts. Programs under the safety system should be clearly linked to the JHA for ease of reference. Training is a professional discipline that requires knowledge about multiple learning theories, presentation skills, survey and assessment, current research on human performance, and various learning strategies. It is not just a PowerPoint© presentation and should be implemented with a strategy that understands the nature of organization and the workforce. Organizations have the responsibility to ensure that their employees are trained to achieve its objectives and that each employee understands the hazards of their work environment and how to protect themselves from specific hazards. An in-depth knowledge of the job hazard analysis (JHA) process should be developed and used by the leadership team and employees. Without this basic training, it will be difficult to establish an effective and efficient JHA process, which adds value to the organization with overall operational improvement. A safety system supports the development of the job hazard analysis (JHA) process by providing a structure for its use. The safety system is a critical “filter” that allows the communication of essential information and knowledge between the various parts of the organization. An organization consists of many processes that should be coordinated if the organization’s intended goal is to be effectively met. As the focal point for safety-related information, the safety professional is the organization’s memory regarding the documentation of hazards, associated risk, safety system performance, regulatory compliance, job hazard analysis (JHA), etc. This means that the one in charge of the organizations resources, you need to ensure that they are accurate with timely safety-related information. In addition, you must be able to track and locate information as quickly as possible to get it into the hands of the appropriate decision makers for further action. From day one, a library and filing methodology and structure is adopted that will organize all resources. These resources will include hard copies and e-copies of materials, websites information, reports, loss data, risks assessments, electronics books, and much more. The objective is to have a system that can access and retrieve the specific information for a timely and quick response to risk and hazardous situations or request for assistance. Organizations follow a structured methodology to get things done. The methodology may be informal or industry best practice or may be based on some combination of concepts. The end product or service drives the process and dictates what equipment, technology, skill levels, raw materials, etc. are necessary. The requirements of a safety system are directly parallel to those required to maintain the quality of products and services. While the JHA can be used for specific targeted use (incident investigations, PPE selection, training development, etc. ), it must be viewed as a beneficial tool for the ongoing overall process. A number of concepts can be useful when developing a JHA. Six Sigma is essentially an array of problem solving and assessment tools.